Joseph Santa Maria passed away on Thursday, May 11, 2017 at age 84. He was born March 8, 1933 in Bristol, PA.
Joe honorably served in the Marine Corps during the Korean war. In Bristol he was employed at various automobile dealerships. In 1977, Joe and his family relocated to Indio, Calif. where he was employed as an automotive mechanic for General Telephone. In 1993, he retired and moved to Maui, Hawaii. After ten wonderful years in Hawaii he relocated to Las Vegas, Nev. and in 2006 settled in Bullhead City. Joe enjoyed music, baking (especially Italian Easter bread) and socializing. 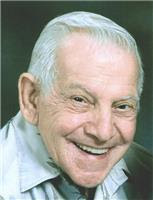 He is survived by his wife of almost 60 years, Joan; their children, Joseph Jr. (Donna), Anthony (Danielle), Joanne, Edward, Diane (Michael) Boyer, Thomas, Dominic, Vincent (Cheri), and James (Anna); his twin sister, Cecilia; brother, Fred (Regina); 22 grandchildren; 13 great-grandchildren; and many nieces and nephews. At his request, no services are planned.